Our 18th birthday was on Thursday! The only wild and crazy thing we plan on doing to celebrate is register to vote, which isn’t actually crazy-it’s sensible (unless, of course, we register as the opposite political party our parents belong to, which we are not planning on doing anyway!). I guess you could call making this cake somewhat crazy, since it is sweet, buttery, delicious, and not conducive to good health. 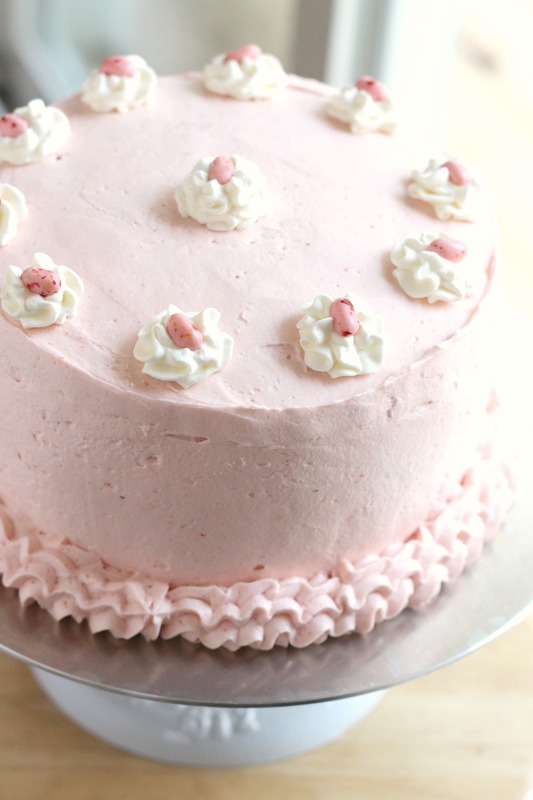 This cake does have some artificial strawberry flavoring in it from Jell-O along with strawberry puree (we used organic, to, uh, balance out the food coloring). 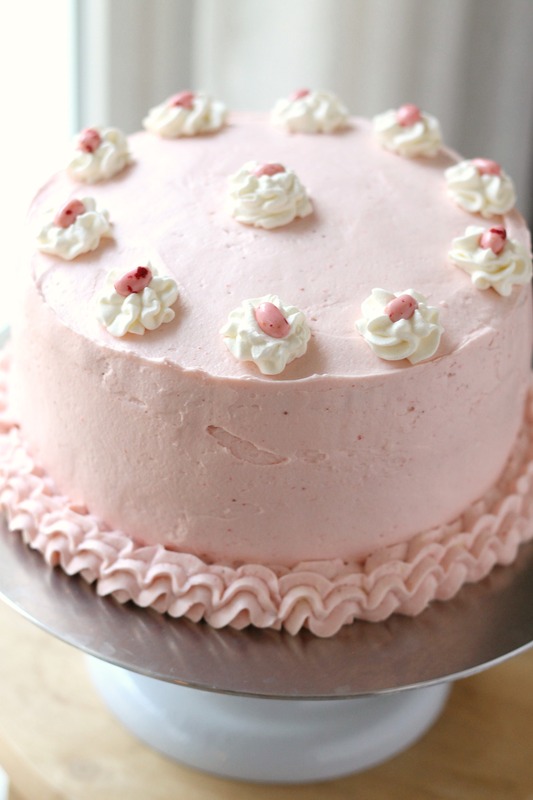 We usually like making things without any preservatives, but we made an exception for this cake. 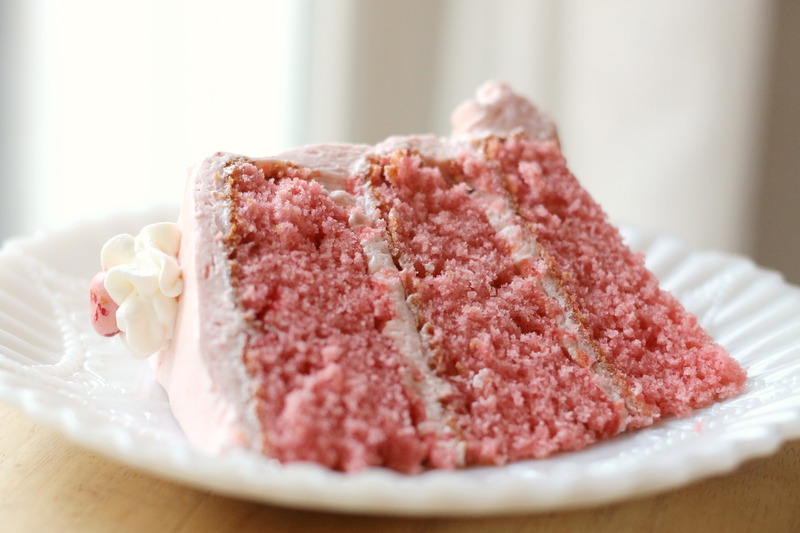 Naturally colored/flavored strawberry cake is wonderful, but you can’t get the bold flavor and color without some artificial additives. For a cake this good, it is worth it! We found a bag of mixed ice cream-flavored jelly beans at The Fresh Market and used, per Sweetapolita’s instructions, the strawberry ones to decorate. They add a fun touch to the cake. Puree a couple handfuls of thawed frozen strawberries until completely smooth. Set aside. Preheat oven to 350°F. Butter, line with parchment, and flour three round 8-inch pans. In a measuring cup, combine the milk, 1/4 cup of the strawberry puree, and the vanilla. Sift and whisk together the dry ingredients in a medium bowl. In the bowl of a stand mixer fitted with the paddle attachment, beat the butter, Jell-O, and sugar. Beat for 5 minutes until light and fluffy. Add eggs one at a time, mixing thoroughly after each adddition and scraping the bowl with a spatula. Alternate adding the wet and dry ingredients, starting with flour (3 flour additions, 2 milk additions). Scrape bowl in between additions. Do not overmix. Divide the batter evenly between the three prepared pans and bake the cakes for 25-30 minutes, rotating and testing after 20. Let the cakes cool briefly in pans, and then allow to cool fully on a wire rack. Beat the butter in the stand mixer with the paddle attachment for 8 minutes. Add the powdered sugar and vanilla and beat for 1 minute on medium speed. Mix on high for 6 minutes. Beat in strawberry puree. Frost cake layers as desired, garnishing with whipped cream and jelly beans. Slice and serve. Enjoy! Note: Refrigerate the cake if you’re not using it within a few hours. It will also slice more nicely after it has been chilled.